Wan Chai’s Bread & Beast transitions from an all-day sandwich eatery, specializing in locally inspired gourmet sandwiches to a dual space, with the unveiling of KONG. After sunset, KONG transforms to a sit-down restaurant and cocktail bar that pushes the boundaries of traditional Hong Kong flavors with a range of playful sharing plates and a lively beverage program that celebrates Chinese spirits. The space is now Bread & Beast by day, and KONG by night. The shop, having undergone a complete renovation that brings to the forefront a modern Hong Kong aesthetic aims to do the same with the flavors of Hong Kong. Parallel to the touches of terrazzo (Sesame Rock) and handcraft white tiles that dot the updated interior, the new evening menu offers a juxtaposition of old and new Hong Kong that highlights the vibrancy of Asia’s world city. The new nighttime menu is ideal for groups and uses local ingredients to playfully reinterpret Hong Kong’s classic tastes into a series of Bings & Dips, Small Bites, Big Bites and Noodles. The series of dips including a Black Garlic Aioli (HK$48),Huadiao Liver Pate(HK$68), Strawberry Ricotta (HK$78), Bone Marrow Whip (HK$68), paired with Scallion Flatbread (HK$48) or toasted Ciabatta Bread (HK$38) offers a Chinese spin on the traditional Italian bread basket as our welcoming dish; Angry Cauli (HK$78) Slow Cooked Charred Cauliflower, Toban Djan Broth and Chili Oil; KONG Fried Chicken (K.F.C.) (HK$158) with Preserved Lemon Jam and Dried Plum Shichimi; Cherry Kola Brisket Cheung Fun (HK$148) Slow Cooked Barbequed Brisket, Kola Caramel, Pickled Cherry, and Seared Cheung Fun; and Shelter Crab Cheesy Cheung Fun (HK$168) Butter-Fried Super Lump Crab & Cheung Fun, X.O. Cheesy Sauce, and Shelter Spice Crumbs. “This year we had opportunities to take Bread & Beast abroad, through our participation at the World Food Championship Sandwich Competition in the U.S. and at a hawker center pop-up in Melbourne. These experiences showed us that global audiences finds Hong Kong flavors as charming and craveable as we do. We were motivated to develop a concept that will spark a discourse of what the natural evolution of Hong Kong’s cuisine looks like. 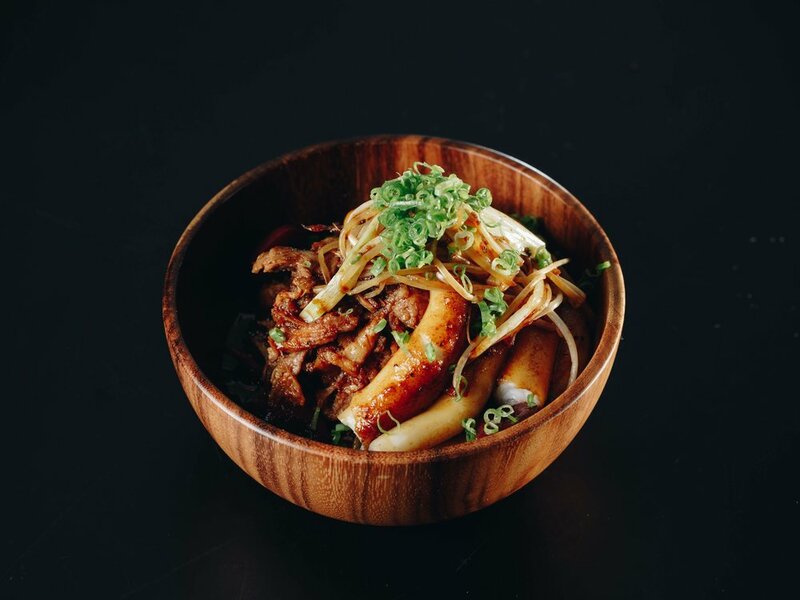 Our hope with Kong is that it will offer a showcase of progressive Hong Kong flavors that the world will fall in love with,” says Co-Founder Chris Cheung. Equally daring and impressive is Kong’s new cocktail program, incorporating Chinese spirits and some of the oldest alcohols in the world such as Huadiao, Baijiu and Glutinous Rice Wine, in addition to some of Hong Kong’s favorite ingredients. The Vodka Fa Diu Soda (HK$98) combines vodka with house infused pineapple huadiao, rose honey syrup, with soda water; while another signature, Baijiu Negroni(HK$108) mixes Baijiu, Campari, Rosso Vermouth, while highlighting the complexity and aromatic profile of Chinese Baijiu; Ham +0(HK$98) marries a classic mule with a classic local flavor by refreshing vodka with Salted Lemon Kumquat Syrup, House-made Ginger Ale, Lime and Bitters; An irresistible, summer pleaser, Mama Mia (HK$88) combines a gin base with Glutinous Rice Wine, Chinese Triple Distilled Rice Wine, Lime and Watermelon; the Yeung Jee Gum Lo(HK$118) mixes Cachaça, Coco Rum, Mango Puree, Fresh Milk, and Grapefruit to pay homage to one of the most iconic Hong Kong desserts - mango pomelo sago and is a must try when visiting KONG. In the cocktail world, Chinese spirits are often misrepresented and misunderstood, KONG hopes to remedy this by celebrating and exalting these undervalued heritage spirits. “We wanted to create a concept that communicates our teams’ backgrounds and experiences. We are from Hong Kong but have all traveled and lived abroad. Experiences have shaped our tastes, but Hong Kong is always in our hearts and on our plates,” says Justin Wong who developed KONG’s inventive cocktail program. In addition to the new menu offerings, KONG also serves up a lively entertainment program featuring live music and trivia nights.